In fact, there are many variables to consider before making such a purchase. That’s why we will go over the most important facts that will help you make an informed decision. By the end of this article, you’ll know exactly what to look for when choosing the right awning for your home. air conditioner work less to keep your home nice and cool during the summer months. That, in turn, will reduce your electric bill cost. When installing over a door, awnings can provide shelter from the unexpected rain when trying to enter your home. They are ideal when used on houses that have no front porch. 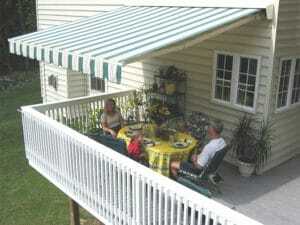 Your local deck builder can install beautiful awnings that will enhance the appeal of your home. This doesn’t make awnings any less useful on decks and patios, however. Not only can an awning provide shade from the summer sun, it also provides shelter against rain, and to a lesser degree shelter from the wind. This will not only protect you but any furniture you have on your deck or patio. 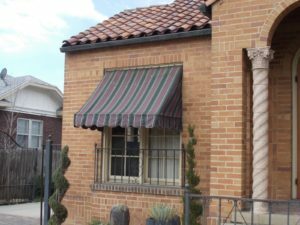 There are different types of awnings available. The simplest awning is made of canvas and is in a fixed position, unable to move or retract. These are perfect for awnings that go over windows and doors. Retractable awnings are perfect for the deck and patio. They can easily be retracted and closed to offer shade and rain protection when you need it or don’t. These are very popular among homeowners too. A deck building contractor can help you pick out some wonderful products. There are also motorized awnings that work much the same way as retractable awnings, with one difference. Motorized awnings do not need to be manually opened and closed. At the touch of a button, from inside or outside of your home, these awnings will open or close automatically. Now that you know the types of awnings and facts to help you make a more informed purchase, go crazy! You can find a local awning repair company in your town that offers installation and service. 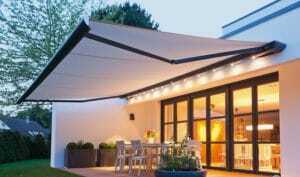 Choosing the right awning can be much easier than you ever thought possible.